This is a homemade scintillation radiation detector using BC-412 scintillating plastic. 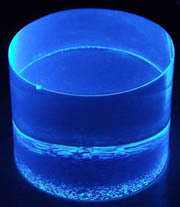 The plastic scintillator converts higher incident radiation to visible light in the blue region. 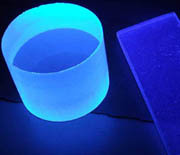 This is shown in the top pictures where the plastic is seen glowing under ultra-violet light. The block can be coupled to a Photomultiplier tube after polishing the scintillating plastic so that the surfaces become internally reflecting. 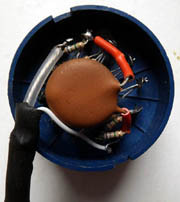 The PM tube requires a cascading voltage potential along it's Dynodes from the Anode to Cathode. 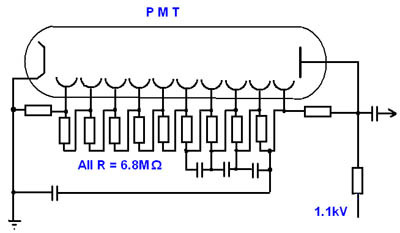 This is simply achieved with a large potential divider as shown in the circuit schematic. The circuit also fits easily into the back of the PMT socket. 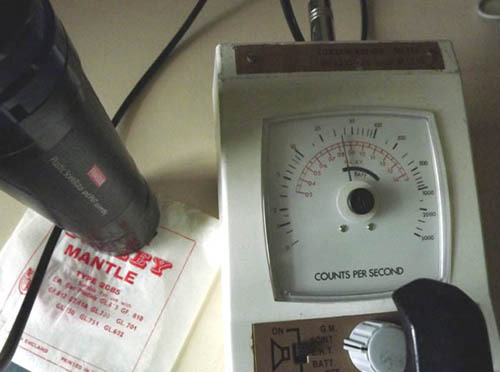 The plastic scintillator and PMT is finally made light-tight with black insulating tape. The scintillating plastic block has been covered with tinfoil before applying insulating tape. The assembly was then tested using a contamination meter with an adjustable EHT. The detector starts detecting particles with an anode voltage of around 850V but only seems to detect high energy particles. With an operating voltage of 1.1kV the sensitivity is similar to my G-M counter. The test picture shows a reading being obtained from a Thorium coated mantle. This is known as an alpha-emitter, but as radiation is detected by the scintillation probe it must have passed through a layer of paper, insulating tape and tinfoil to interact with the scintillator. This would suggest beta particles are present, perhaps from daughter products to account for the high reading.